Kenneth Jackson, Columbia University Professor of History, describes Weeksville, an African American village that emerged in Brooklyn in the mid-1800s. 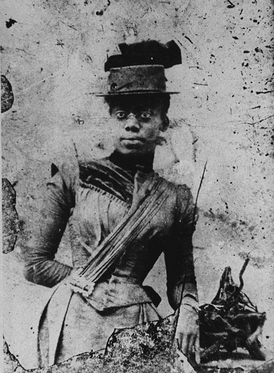 This unidentified photograph was found in Weeksville, one of the earliest free black communities in the country. 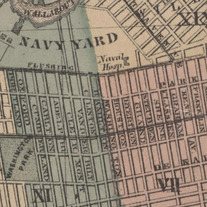 Located in Brooklyn, it was a refuge for those fleeing both slavery and racism. 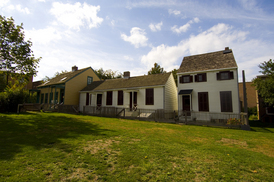 You can visit the Weeksville Heritage Center located at 1698 Bergen Street between Rochester and Utica Avenues to see the three restored Hunterfly Road Houses. Far from the bustle and racism of Manhattan, on what was then the outskirts of Brooklyn, free blacks built a community called Weeksville. The community began when a black longshoreman from Virginia, James Weeks, bought a plot of land in 1838, just 11 years after slavery ended in New York State. Soon others followed and built schools, churches, an orphanage, and an old-age home. Black-owned businesses grew and one of the country’s first African American newspapers, Freedman’s Torchlight, was published. The community boasted the first black female physician in the state and the first black police officer in the city. It was a stop on the Underground Railroad and, after the Civil War Draft riots of 1863, a refuge for black families fleeing the racist violence that spread across Manhattan. By 1968 Weeksville and its history were largely forgotten until historian James Hurley and pilot Joseph Haynes set out to find it—from the air. Remarkably they found four small buildings, overgrown and dilapidated, but original. Then Joan Maynard, an artist and member of the community, got involved. She was determined to restore the homes as a museum. With her leadership and lots of community support, the buildings became New York City landmarks and were placed on the National Register of Historic Places. In 1968, and $3 million later, Maynard saw the first building restored and opened to the public. Today The Heritage Center is located at 1698 Bergen Street between Rochester and Utica Avenues.